It’s actually a bit of a black hole in my memory, what I was doing, that Tuesday. Of course, I found out well after the fact, as I was on a distant coast, and by the time I wakened from the autopilot of workout, breakfast, fixing lunch, and saying goodbye, I was through two loads of laundry, had the sliding glass door open, and was considering how hot it was going to get, and if I had time to go through all of the mail before I sat down to get writing. I mainly remember a moment of distant surprise when TechBoy called, moments after he’d left. I thought he’d forgotten his coffee. “The songs are wrong,” Peter observes, caught, as he was, skipping study hall to be downtown at Tower Records right when it opens, hoping to get the new Dylan CD. He can no longer listen to his CD player, because none of the music seems right. There is no music deep enough for bewilderment and tragedy. There is no music to right the wrong of a confetti of office memos and business letters flying through the air, of the smell of death in the wind. Claire, dutifully attending homeroom, slips away to the elementary school to retrieve her little brother. She holds hands with a fellow student as she crosses the street; Marisol, a girl she doesn’t know well, is holding on. The connection seems important. There’s smoke in the air, ambulances screaming by, and people shuffling silently, covered with ash. Jasper, slightly hung over and grumpy, wakes up when it’s all over, and watches the footage again and again and again, while answering hundreds of emails and a phone call from his parents in Korea that all ask the same thing, Are you all right? Please tell me you’re okay. Jasper was supposed to go out with this kid, Peter, he met at a party, but now he’s not sure. Should dating go on? Should concerts? Can people still joke? Claire and Peter, Jasper and Claire, Peter and Jasper circle each other in an awkward dance of friendship and in sometimes painful and sometimes profound attempts to find expression and comfort in each other and to make sense of what has happened to their city and in their world. They share their stories, their fears, their worries. Love is the Higher Law is a difficult book to read – I had to set it down, because it was written so well, and the memories were visceral. The novel doesn’t follow the usual story arc – there’s a detached, almost dreamily elegiac quality to some of the chapters, which exchange voices between the three young adult characters. As their world wrenches and rebounds, their shared reactions are both completely alike, and wildly divergent. 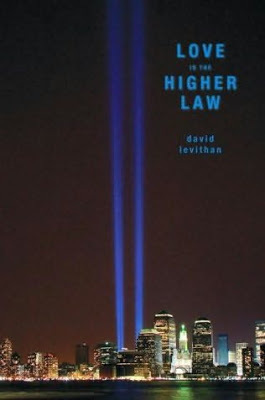 David Levithan is a New Yorker whose own impressions of that bewildering, horrifying, terrifying day are reflected in these pages. Few readers, teens and adults alike, will be able to experience this novel without remembering their own story — where they were that day, what they did. In a way, our voices are as important to the narrative as are the voices of the characters. As we read the novel and remember who we were then, we remember what mattered, and how goodness can be forged in the fire of trauma and loss. The memorial was raised to remind us that no matter how often we return to the grief of that day, we also return to the memory of hands reaching out to light candles, bring food and water, and search for the lost. In the midst of tragedy, we remembered how to step out of ourselves and become better than we were, proving the law of love, which makes us more than we are. David Levithan’s Love is the Higher Law is a journey through loss and hope, and can be found at an indie near you. PSSSST. Hey, Texas. We’re COMING!!!! Breakfast, laundry, writing–such an ordinary day. I still take that day in my hand like a coin and turn it over and over, looking for answers to unanswerable questions.